Gartner, the world’s leading information technology research, and advisory company have revealed some data regarding the worldwide smartphone shipments in vendors & mobile OS. 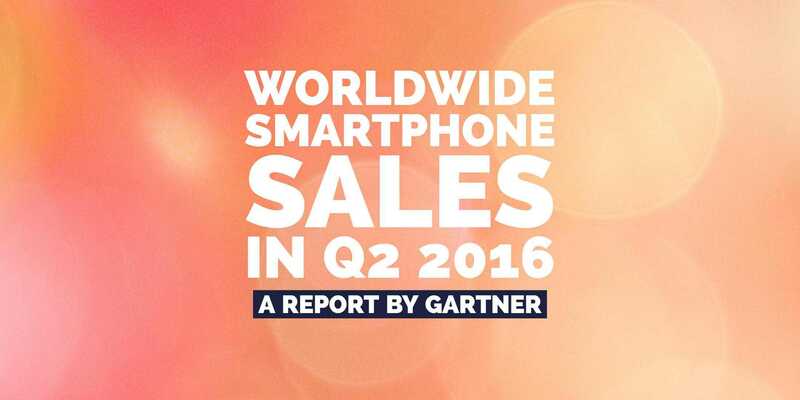 Surprisingly, five of the top 10 worldwide mobile phone vendors increased the sales in the Q2 2016 comparing to Q1 2016. The global increase in smartphone sales is 4.3%. Sad news for Apple fans is that Apple is facing three consecutive quarters low demand as their sales declined by 7.7%. Worldwide sales of smartphones to end users totaled 344 million units in the second quarter of 2016, which is a 4.3% increase over the same period in last year. Overall sales of mobile phones contracted by 0.5 percent with only five vendors from the top 10 showing growth and another fact to check here are that among those top 5. Among them were four Chinese manufacturers- Huawei, Oppo, Xiaomi and BBK Communication Equipment. And of course, Samsung is still at the top. In addition, the decline in sales of “feature phones” (down 14 percent) bolstered the decline in overall sales of mobile phones in the second quarter of 2016 (see Table 1). In the second quarter of 2016, Samsung had nearly 10 percent more market share than Apple. In the competition, Samsung’s Higher mid-range phones from the A Series and mid range phones from their J Series helped them compete against Chinese manufacturers, who have been coming up with great value for money smartphones. Meanwhile, Apple continued watching a decline in sales by 7.7% in the second quarter of 2016. North America, which is Apple’s biggest market and also the Western Europe has declined. But the worst sales decline happened in Greater China and Asia-Pacific regions, where sales declined by 26%. But Apple had its best performance in Eurasia, Sub-Saharan Africa, and Eastern Europe regions in the second quarter of 2016, where iPhone sales grew more than 95% year on year, this is really a big improvement in sales. In the second quarter of 2016, Oppo showed the highest growth resulting an increase of sales up to 129%, and it is believed that Oppo R9 was behind pushing up the brand as the handset became very popular in China as well as in other countries. Now we have talked about the hardware and provided the details about the smartphone sales in terms of units sold in the second quarter of 2016, over the same in 2015. Let’s talk about the software or OS. Android continues to rule over others to achieve an 86% share in the second quarter of 2016. The main reason for Android’s dominance is the increasing number of Android smartphone sales as both mid and high range smartphone sales increased in emerging markets and developing nations, which resulted in a 6.5% increase in the second quarter of 2016. 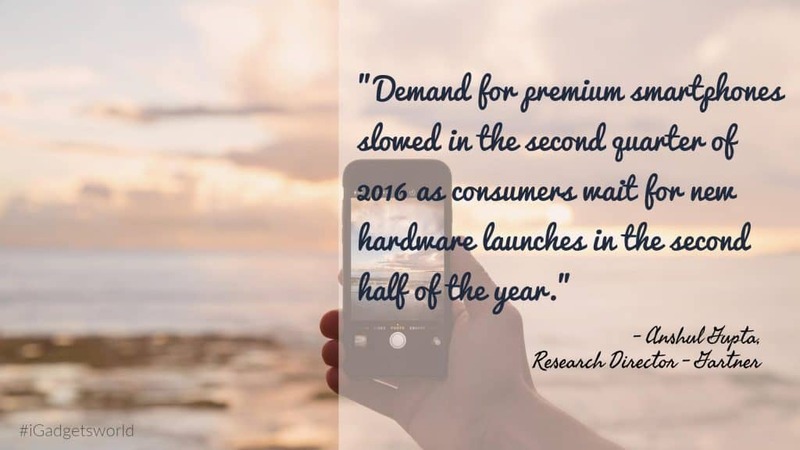 As brands like Samsung are introducing new flagships like the Galaxy S7 and S7 Edge, Galaxy Note 7 from their extremely popular Note Series, Chinese brands like Oppo, Mi and Huawei are pushing their sales with affordable but premium devices. “The top five smartphone manufacturers together continued to gain market share in the second quarter of 2016 — up from 51.5 percent to 54 percent year on year, led by Oppo, Samsung, and Huawei,” said Mr. Gupta. So, overall we can see a massive growth in the smartphone sales from globally less familiar brands like Oppo, Xiaomi rather than well established Samsung. And as Google is trying to bring Android to everyone, on every device the job gets easy for them to push Android to more and more consumers. However, if you need additional information , you may check out this report from Gartner.